At Care Orthodontics, our treatment philosophy centers on personal care and restoring a beautiful smile to your life. A healthy, uniform smile can inspire confidence and joy, and it’s our job to help patients achieve that smile. 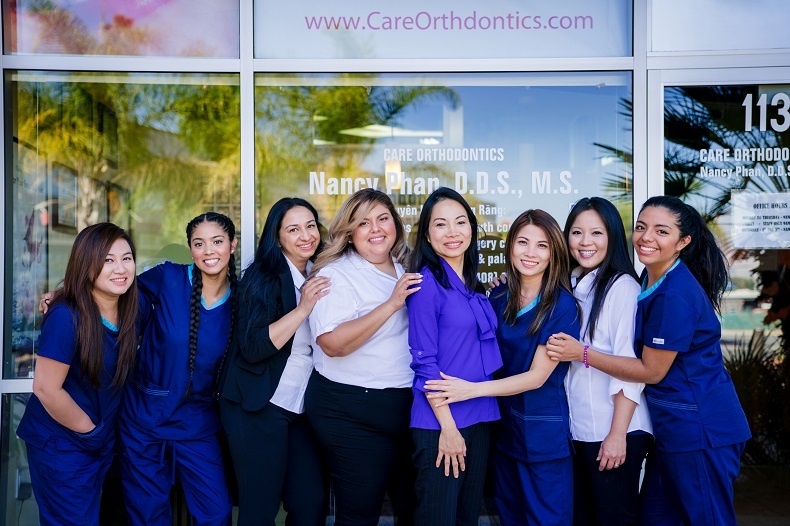 Nancy Phan, DDS, MS, is your San Jose orthodontist dedicated to giving patients smiles they can be proud of. Through diverse treatment plans and affordable payment options, patients leave Care Orthodontics with healthy, functional smiles. We are a friendly orthodontic office with the goal of developing close relationships with our patients. Unlike large corporate settings with less emphasis on the individuals, we care about the day to day interactions with all our patients. We place heavy emphasis on providing great customer service, render quality treatment, and deliver care within a comfortable environment with affordable financing. San Jose orthodontist Dr. Phan and her team provide personalized care that elevates the needs of each patient. Treatments are designed to address your health needs while accommodating your aesthetic goals. We take time and pay attention to the details of each smile and then develop the treatment in a caring, friendly, and pleasant environment using state-of-the-art technology. We recognize the impact oral health has on the rest of the body and strive to practice gentle care that protects your overall well-being. Digital X-rays reduce patient radiation exposure and produce detailed images that are used to educate patients on their orthodontic treatment. Throughout the treatment process, our San Jose orthodontist works with your general dentist to ensure we are complimenting existing treatment plans. By explaining treatment with in-depth images and demonstration, we help individuals take charge of their care through every step of treatment, keeping patients updated on their progress and aware of any changes in their oral health. Dr. Phan offers her expertise for young patients in need of multiple phases of orthodontics, so they can have a beautiful smile throughout the rest of their life. For individuals who want inconspicuous orthodontics, we have braces with ceramic brackets; we also offer the near-invisible Invisalign® treatment. No matter the recommended treatment, Dr. Phan gives each patient the attention they deserve to fully restore their smile from our San Jose orthodontics practice. To further care for our patients, we pursue continued education courses to offer the best technology in the orthodontic field. Dental lasers and digital examinations provide patients with convenient, personalized treatments, improving patient education and creating more precise treatments. With digital impressions for Invisalign®, Care Orthodontics is able to provide patients with positive, comfortable experiences throughout their visit. Everything we do is for your smile, from our customized orthodontic treatments to our flexible payment plans and Saturday hours. Since we are an independent practice, we are able to adjust payment plans to fit each budget, making advanced orthodontia accessible for all families. Looking for Orthodontics in San Jose? Care Orthodontics accepts referrals from general dentists throughout the greater San Jose region, including the communities of Los Gatos and Milpitas. Contact us today to schedule your consultation or fill out a referral form today!